Star Wars meets Cannonball Run! Marvel has been killing it recently with their Star Wars comics. Each one is interesting and different, especially the character centric stories, due to different writers and awesome and varied art. The inevitable Han Solo comic is no different. Leia has a top secret Alliance mission for the reluctant hero. His cover; an ancient high stakes galactic race! Named ‘The Dragon Void’, the race is insane but very tempting to a guy like Han. Along the way there is the usual Empire backstabbing and intrigue. There is also a really great cast of supporting characters. Dorae the Selonian has a complicated history with Chewie, and I hope we see more of her in the canon in the future. 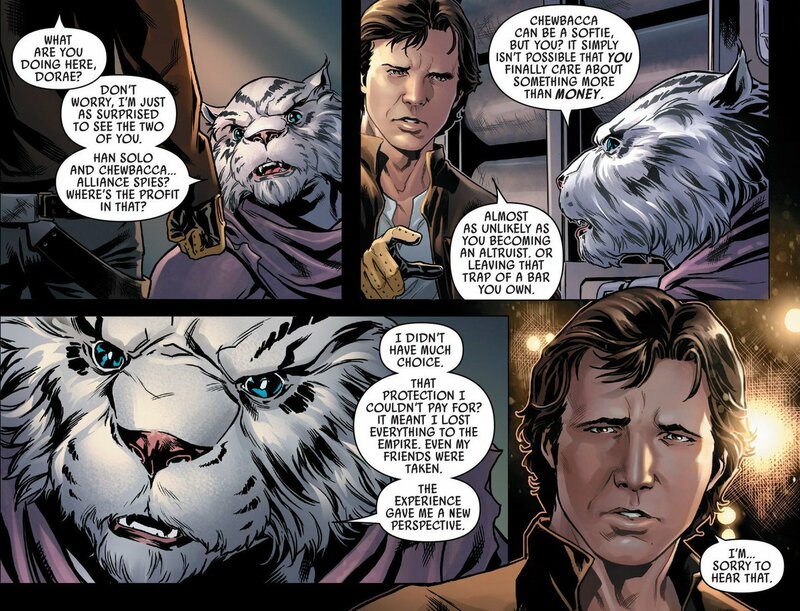 We could do with more giant cat people in Star Wars. The standout character is the mysterious Loo Re Anno. From an unknown species, older than the galaxy, she presents the most mystery. I’m glad they only hint at her history and strange elder-being race, it leaves space for more story or just a nice mystery to flesh out the universe a bit more. Han is great obviously, it’s basically just Harrison Ford in every panel. Knowing where he ends up, a lot of the comic is quite sad. But it does offer a bit more depth to the character, he’s way more than just a scoundrel. Overall, a great comic! A bit weird perhaps for Star Wars purists? I’m not sure. It’s definitely wackier than what you’d be used to. But it’s a nice change and if the Han Solo film can capture half the magic of this comic we’ll be in luck.